In Rural Kenya a Local Restaurant serves ‘Tasty Meat’ for Bitcoin and Dash, truly showing the pioneering spirit of Africa. Beatrice Wambugu, a Kenyan restaurant owner considers herself a ‘cryptocurrency pioneer’ after introducing crypto payments to her restaurant in the rural town of Nyeri. Nyeri is more than 150km outside of the capital Nairobi, serving the Kenyan favourite of ‘Nyama Choma’ (goat meat barbecue). Ms. Wambagu started trading Bitcoin over 2 years ago and gained enough money to buy a local hotel. She then converted it into ‘Betty’s Place’ the restaurant which she created. The restaurant is situated in the heart of the town, welcoming customers with warm yellow walls and big glass windows. 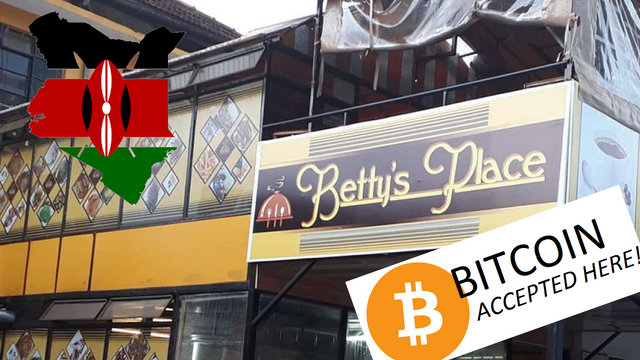 Betty’s Place is not only known for its warmth and good food but as a hub for cryptocurrency in the area. Ms. Wambagu accepts Bitcoin and Dash as payment methods and also runs classes every Sunday on how to trade Bitcoin. “I’ve set aside one day where I can teach my customers. Whoever asks about crypto-currencies: ‘How does it work? What is Bitcoin?’ I train them,” she told the BBC. Mobile phones have allowed Betty’s to take off, and even though her Bitcoin takings have been modest ($300) it has generated a lot of interest internationally. There is a confluence of rural authenticity and modern applications that is almost unique to Africa. Africa bypassed home phones for smartphones, and it may bypass banks for bitcoin. This could be a huge step towards ‘banking the unbanked’ in a notoriously unlegislated region. If bitcoin could spread then huge steps could be taken to reduce the lack of legislation and improve living conditions across the whole of Africa. Although cell phones and crypto may be spreading there is still a long way to go. Nigeria, the largest crypto trader in Africa only has a trading volume of $4 million daily, a tiny amount in the grand scheme. However, this can only increase as crypto spreads across the continent. Ms. Wambagu is a pioneer and more are needed across the world, especially in regions such as this. People like her can genuinely change the world and their areas for the better, removing the corrupting influence of banks and legislating those previously without legislation. It all comes from the individuals. Originally published at altcoinbuzz.io on OCTOBER 23, 2018.